In a retrospective analysis published in Future Oncology, Erickson and colleagues evaluated hydration requirements with emetogenic chemotherapy and investigated the effects of an antiemetic drug combination. In this paper find out how their results could increase our understanding of how to manage chemotherapy-induced nausea and vomiting in order to improve cancer patient’s quality of life and help to reduce health care costs. Aims: Chemotherapy-induced nausea and vomiting diminishes quality of life and increases healthcare resource use. This retrospective medical records analysis evaluated hydration requirements with emetogenic chemotherapy. Patients & Methods: Cancer patients received moderately (MEC) or highly emetogenic chemotherapy (HEC), and antiemetics palonosetron or granisetron extended-release subcutaneous (GERSC), neurokinin 1 receptor antagonist, and dexamethasone. Unscheduled hydration event rates were determined. Results: For 186 patients (92 palonosetron, 94 GERSC) overall, mean hydration rate was significantly higher with palonosetron (0.6 vs 0.2; p=0.0005). Proportion of patients with ≥1 hydration event was significantly higher with palonosetron overall (54 vs 33%; p=0.0033) and in cycles 2-4 and the HEC subgroup. 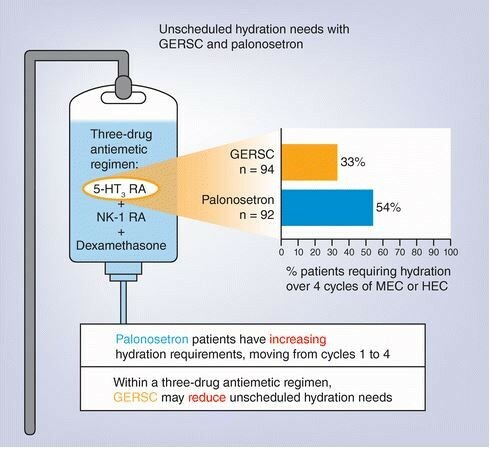 Conclusions: GERSC within a three-drug antiemetic regimen may reduce unscheduled hydration requirements with MEC or HEC.